Signature has been cut off, but this painting is attributed to Charles Waldron. The Great Admiral was built in Boston by Robert E. Jackson of East Boston in 1869. She was the most famous ship of the Weld Fleet, having an active life of 37 years. Named for Admiral Farragut and commanded for 12 years by Captain Benjamin Thompson of Winterport, Maine, the Great Admiral foundered in a storm in the Pacific in 1906. Under the Weld ownership, she was commanded by Captain I.N. Jackson, Captain Benjamin Thompson, Captain William Chatfield, and Captain J.F. Rowell. (The latter also of Winterport.) 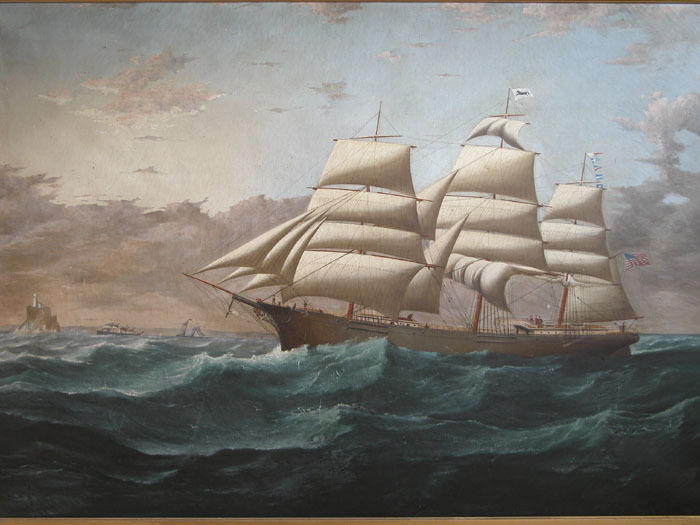 The former owner of this painting (Mrs. Louise Williams) is the only daughter of Captain Benjamin Thompson. The Irish born Liverpool artist Charles J. Waldron had his studio cross the river from Liverpool. Here he puts the lighthouse on Fastnet Rock in the background.